Closed-cell surface that keeps sweat from seeping into the mat and breeding bacteria. Beneath the sealed surface is an open-celled, air-cushioning layer for added comfort and joint protection. This single kit gives you everything you need to immediately begin the fun, exhilarating Ocean Yoga™ and PaddleFitness™ workouts. This kit includes one Ocean Yoga board, one PaddleFitness paddle and two balance pods. Whether you’re a Yogi looking to improve each pose or someone looking for a fun, core-challenging paddleboarding workout—the Ocean Yoga™ board and PaddleFitness™ paddle gives you both options! The instability of Ocean Yoga and PaddleFitness workouts reveals where your practice may be out of balance, or where mind and body are out of sync. The board’s instability allows you to learn balanced technique while synchronizing your mind and body to work as one efficient unit. Balance Pods: Adjustable balance pods simulate a paddle boarding experience and offer three different levels of balance and difficulty. 1: Two-Layer Non Slip, Non Stick Surface The surface of the board is coated with the same soft, non-slip and low odor material of most yoga mats. 2: The top layer is a textured, closed-cell surface that keeps sweat from seeping into the mat and breeding bacteria. 3: Beneath the top layer is an open-celled, air-cushioning layer for added comfort and joint protection. 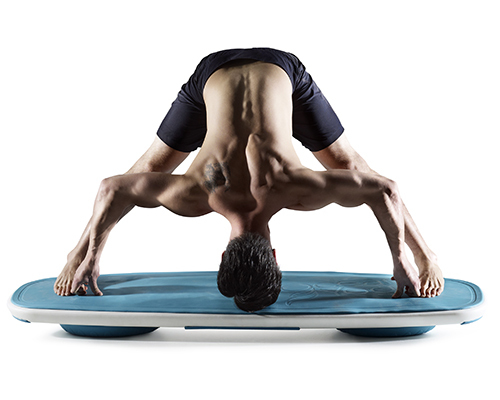 Included Air Pump: With the purchase of each kit of six or more Ocean Yoga™ boards, you receive a balance pod air pump. This allows you to quickly add air to each pod of greater stability, or remove air for less stability. Easy Transport: Rubberized carry grooves on each side of the board allow you to grip it from any direction for easy and comfortable transport. Optimum Stability: Each rubberized handgrip rests on the floor and act as a gripping stabilizer, preventing the board from sliding during your Ocean Yoga™ or PaddleFitness workouts. Muffles Noise: The rubber grips serve as noise mufflers and protect your studio floor by serving as a buffer zone from the floor and hard surface of the board. Without the pods, the board weighs a portable 30 lbs., the same weight as a standard stand-up paddleboard. Strengthen your core, maximize calorie burn and engage your entire body with the PaddleFitness paddle. The paddle is designed after a traditional stand up paddle (SUP), and features a 5 lb., foam-coated sliding weight to give you a customizable, strength-training workout. Three Marked Levels The paddle comes with three laser-etched levels for quick, easy adjustments. Simply loosen the weight stop, slide the weight to any of the marked levels and tighten it until it clicks! Ergonomic Grip Ergonomic palm gripping is designed for maximum control, superior comfort and a reduction in hand fatigure over long PaddleFitness workouts. Foam Coated The 5 lb. 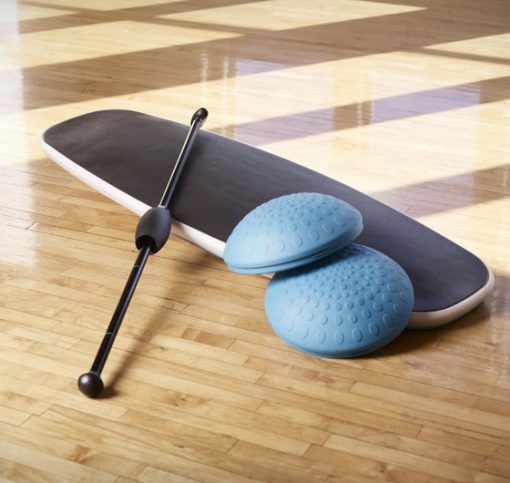 weight is covered with the same soft, durable foam as rollercoaster restraints and can withstand accidental floor impact and the rigors of a tough PaddleFitness workout. 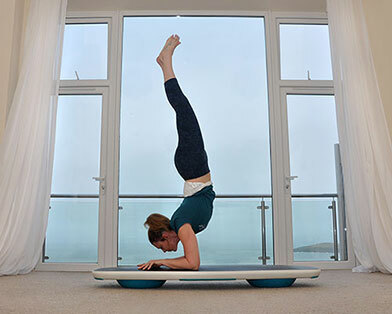 IF YOU WISH TO TRY OUT THIS PRODUCT BEFORE YOU PURCHASE, PLEASE VISIT WWW.OCEANFLOWYOGA.CO.UK WHERE WE RUN PRIVATE SESSIONS AND CLASSES ON THE OCEAN YOGA BOARD AT OUR BEAUTIFUL STUDIO OVERLOOKING THE SEA IN NEWQUAY, CORNWALL. WHY NOT COME AND VISIT US FOR A LONG WEEKEND!